Italian player Francesco Ruffo is leading the Battle of Malta €1,320 High Roller with 888poker Ambassador Ana Marquez in second place. Ruffo has 276,000 while Spanish pro Ana has 253,000. There were 241 entries for the tournament and among the 64 remaining are WSOP finalist Fernando Pons, Scottish pro Gordon Huntly and leading Estonian player Henri Kasper. Others who competed but are now out of the running include Paul Jux-Holderness (who beat tennis legend Boris Becker heads-up in the Pink October Malta charity event), Grosvenor Passport winner David Gee. Ireland’s Davey Daragh and WPT Deepstacks Player of the Year Rex Clinkscales. Chip leader Ruffo has $22,500 in live tournament winnings to his name including a runner-up finish in the EPT Malta NL Turbo in 2015 for $15,740. His leading chip rival Ana Marquez has won more than $1.2m in live tourney cashes. 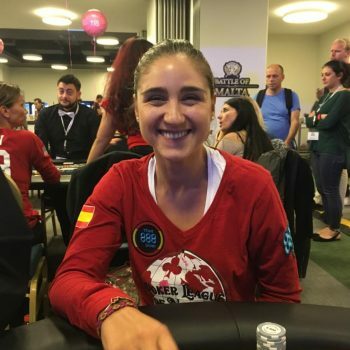 In addition to huge wins like the Hollywood Poker Open in 2013 for $320,189, she was runner-up in the Ladies Event here two days ago and is now keen to add a second Malta flag to her resume. The 31-year-old Spaniard from Malaga became an 888poker Ambassador last July and has been playing poker since 2008. She first hit the poker headlines in 2011 when she was the last woman standing at the PokerStars Caribbean Adventure in the Bahamas, eventually finishing tenth for $155,000.